The Survey found that United Kingdom has pursued continued development on e-government innovation, and its Government Digital Service has been replicated by other countries around the world. Australia and the Republic of Korea recently established robust telecommunications infrastructure, invested in developing their human resources, expanded usage of e-government facilities and extended service delivery. At the regional level, the Survey found that Europe continued to lead on e-government, followed by the Americas, Asia, Oceania and Africa. Europe was led by the United Kingdom. Oceania was led by Australia. Republic of Korea topped the list in Asia. 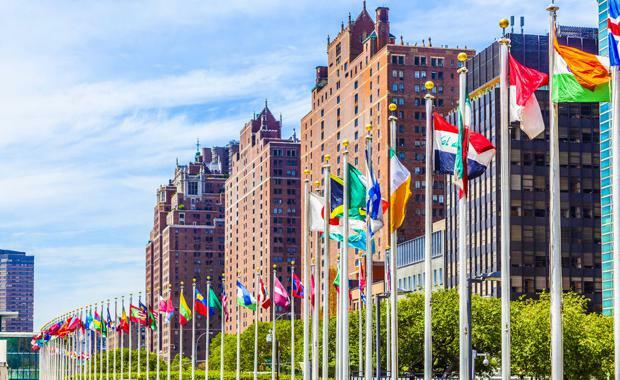 The United States led countries in the Americas, and ranked twelfth overall, Mauritius was the top performer in Africa, and ranked 58th worldwide. 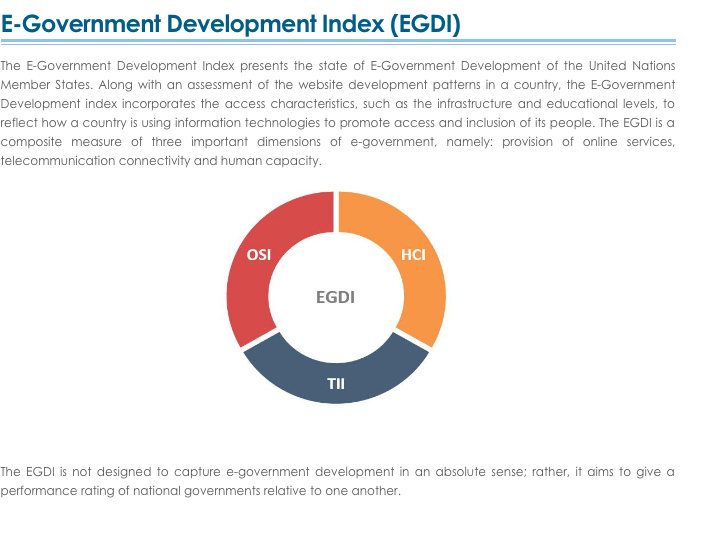 The rankings are based on the report’s E-Government Development Index (EGDI), which ranks countries by measuring their use of information and communications technologies to deliver public services. The Index captures three dimensions: scope and quality of online services, status of telecommunication infrastructure and existing human capacity. A key theme is how information and communications technology (ICT) and e-government can best contribute to the implementation of the SDGs. Effective use of ICTs by governments can help people connect to the services they need, as well as to create a fair society that provides equal opportunities for everyone. E-government has grown at a rapid pace over the past 15 years. In the 2016 Survey, 29 countries score “very-high,” with EGDI values in the range of 0.75 to 1.00, as compared to only 10 countries in 2003. Since 2014, all 193 Member States of the UN have delivered some form of online presence. This is in stark contrast to 2003, when 18 countries, or about 10 per cent of all countries, were without any online presence. In 2016, 51 per cent of countries had “low-EGDI” or “medium EGDI” values, down from over 73 per cent of countries in 2003. According to the report, there have been increased efforts to utilize advanced electronic and mobile services for the benefit of all. But fixed and wireless broadband subscriptions have increased unevenly across regions. Europe leads the world, while Africa is still lagging behind. While the overall availability of broadband has increased, substantial regional disparities and a growing divide persist. All countries agreed, in SDG 9, that a major effort is required to ensure universal access to internet in the least developed countries. The Survey indicates that countries in all regions are increasingly utilizing new information and communication technologies to deliver services and engage people in decision-making processes. One of the most important new trends is the advancement of people-driven services – services that reflect people’s needs and are driven by them. At the same time, disparities remain within and among countries. Lack of access to technology, poverty and inequality prevent people from fully taking advantage of the potential of ICTs and e-government for sustainable development. In 2016, there is still a huge gap between African countries, with a EGDI average of 0.2882, and European countries, with EGDI average of 0.7241. Europe provides 10 times more services to the poor, persons with disabilities and older persons than Africa and Oceania. To realize the full potential impact of e-government for sustainable development, the report found that it needs to be accompanied by measures to ensure access and availability of ICT and make public institutions more accountable and more responsive to people’s needs. It concluded that it is essential to ensure that the overarching objective of poverty eradication and “Leaving No One Behind”, a key principle of the 2030 Agenda, are at the core of efforts to mobilize ICT to realize the transformation the 2030 Agenda demands. The UN E-Government Survey is produced every two years by the UN Department of Economic and Social Affairs. 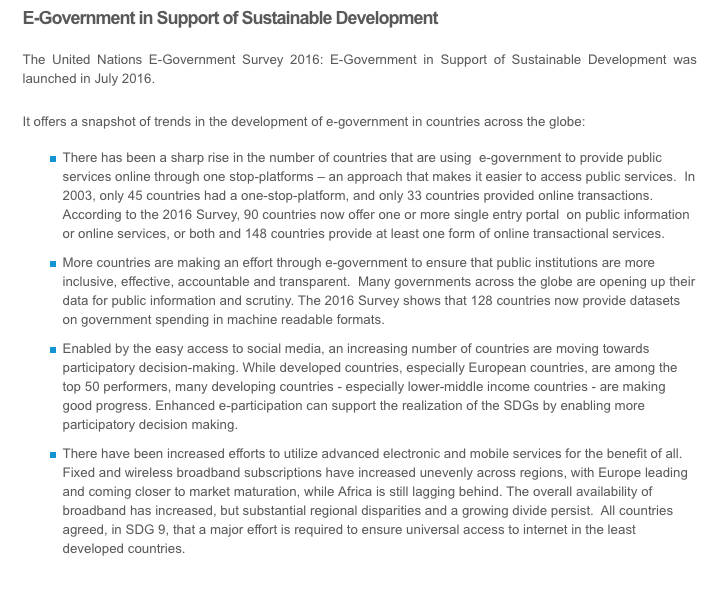 It is the only global report that assesses the e-government development status of the 193 UN Member States. It aims to serve as a tool for countries to learn from each other, identify areas of strength and challenges in e-government and shape their policies and strategies in this area. It is also aimed at facilitating discussions of intergovernmental bodies, including the United Nations General Assembly and the Economic and Social Council, on issues related to e-government and development and to the critical role of ICT in development.